Thermal activation sensitized fluorescence, or TASF, is a new type of TADF OLED emitter material developed at China's Tsinghua University. 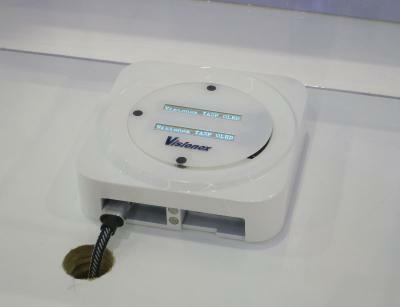 During SID Displayweek, Visionox demonstrated the first TASF prototype display. We do not have a lot of information on this new emitter technology, except what Visionox provided at the conference: a sky-blue color (468 nm, CIE: 0.153, 0.201), a luminous efficiency of 26.6 cd/A and an external quantum efficiency of over 17%. The brightness of this OLED PMOLED display was 800 nits. 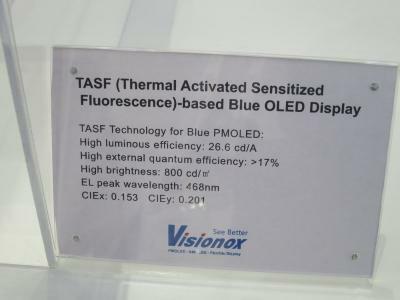 TADF is certainly a hot topic these days, as many believe that it is the most promising technology towards high-efficiency blue OLED emitters, and it was interesting to see this new TADF variant called TASF. Here is the original 2015 TASF patent application in China.